Hide treats and your pet can start playing the Dog Casino game. You can place treats in the drawers, which your dog then needs to open in order to find the reward. The game is a nice way for pets and owners to spend time together. Gambling with your dog has never been so much fun. The game board of the Dog Casino has various drawers that you can hide tasty treats in. The dog can then look for the biscuit or treat by pulling them open on the different sides. To make the game even more challenging, you can fix the drawers in place by turning the bones. The Dog Casino has a difficulty level of 3. Please look here for more information about the games of Nina Ottosson. Please note: Suitable for any dog, regardless of age, breed or size. Make sure that this game is always given under constant supervision. 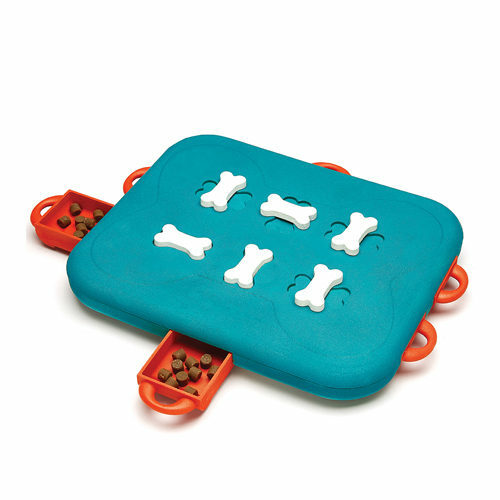 The Dog Casino is made of recycled plastic, which can be easily cleaned with water and soap or placed in the dishwasher. Always check that there are no soap remains in the game after washing. Have you used Nina Ottosson Dog Casino before? Let us know what you think about this product. Our dog loves this game. She gets so excited even when the game comes out of the cupboard and she really enjoys seeking out the treats. Great fun for dogs and owners.